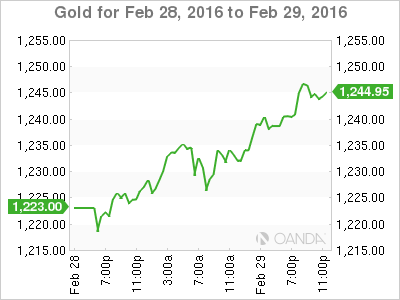 Gold has recorded considerable gains on Monday. In the North American session, the spot price for XAU/USD is $1232.15 for one ounce. On the release front, Chicago Pmi dropped sharply to 47.6 points, while Pending Home Sales declined by 2.5%. On Tuesday, the US releases Ism Manufacturing Pmi. It’s been a slow start in 2016 for the US economy, with soft growth and employment numbers in comparison with the red-hot numbers which characterized the second half of 2015. This was underscored on Monday, as PMI and housing numbers were very soft. Chicago PMI slipped to 47.6 points in February, compared to 55.6 points a month earlier. Weak housing numbers continue to raise concerns, as Pending Home Sales posted a sharp loss of 2.5% in the January report. This reading comes on the heels of New Home Sales, which slipped to 494 thousand in January, compared to 544 thousand a month earlier. This figure was well short of the Estimate of 522 thousand. Weakness in the US economy has been a boon for gold prices, as nervous investors continue to seek safe assets and avoid risk in uncertain economic times. The US economy has been grappling with a downturn in global demand, which has taken its toll on the export and manufacturing sectors. However, there was some positive news late in the week. US Preliminary GDP for the fourth quarter posted a strong gain of 1.0%, well above the estimate of 0.4%. There was also positive news from the manufacturing sector, as Durable Goods sparkled. Core Durable Goods rose 1.8%, crushing the estimate of 0.2%. This marked the key indicator’s strongest showing since March 2014. Durable Goods Orders followed suit with a sharp rise of 4.9%, rebounding from the previous reading of -5.1%. This was stronger than the estimate of 3.0%. XAU/USD posted gains in the Asian session. The pair has been choppy in the European and North American sessions. XAU/USD ratio is unchanged, consistent with the lack of movement from the pair. Long positions retain a slight majority (53%), which is indicative of trader bias towards gold moving to higher levels.